Annette Schavan, former federal minister of education and research in Germany, will present “Engaging Students to be Catalysts for Innovation” at 11 a.m., Thursday, Feb. 14, in the Popp Martin Student Union, Multipurpose Room. Schavan, who also served as the German ambassador to the Holy See (Vatican), is a former member of the German-Federal Parliament. 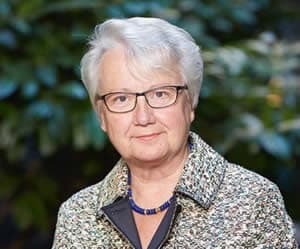 She spent much of her political and professional life in the German state of Baden-Wurttemberg, a center for many of the country’s mid-sized companies, including Daimler AG, Porsche, Bosch, Zeiss and Zap. During her Feb. 14 presentation, Schavan will address how education can contribute to creativity and innovation. RSVPs requested: email cri-web@uncc.edu; seating is limited for this event, sponsored by the Charlotte Research Institute. The Office of International Programs, College of Liberal Arts & Sciences and the Cato College of Education provided promotional support.